With three storeys of carefully designed living accommodation on a footprint just 2.8m in width, the innovative layout sees a double and single bedroom provided alongside a split-level living, kitchen and dining area. 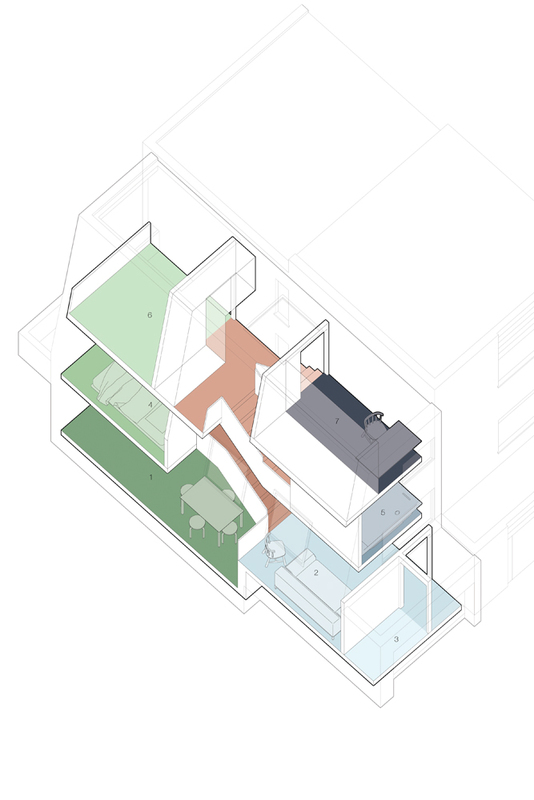 The design also incorporates a full sized bathroom, study and south facing roof terrace set into the building envelope, all book-ending a 1960's terrace. This additions continues alma-nac's research into the subject of urban dentistry, using their expertise to turn left-over pieces of land into imaginative spaces for living. The proposal sees the neighbouring brick facades referenced in a playful use of material; with patterned and perforated details differentiating it from its neighbours.